Alternately designed to protect us and to accept our own input as though it were a computer we were constantly updating-- the potential of the human mind and our memory in particular is an unfathomable and undeniable enigma. 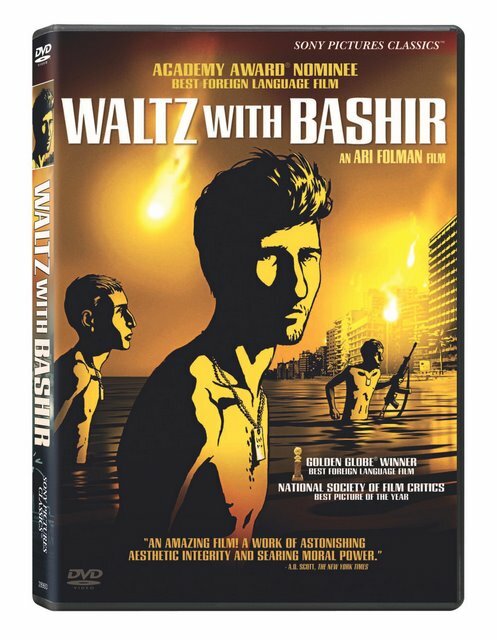 As filmmaker Ari Folman quickly discovers early on into his surreal, haunting and humanistic autobiographical animated documentary Waltz With Bashir, when we're faced with something so horrifically unbearable that we're not sure how to process it, we can disassociate ourselves from the experience. Thereby, we can then view stimuli we encounter as though it were projected via twenty-four flickering frames per second on a screen in a movie theatre. Yet, when that camera breaks-- as one interviewee reveals to Folman later into this stunning achievement-- and we become self aware as though we've finally succeeding in breaking down that fourth wall to realize that we're actually experiencing the devastation firsthand, the results can be too much for us to accept. Since memory itself is dynamic, alive, visceral, and it constantly feeds off of new sensory data with each passing moment, it's only fitting that it can trick us as we will mentally fill in any gaps in our recollections as we see fit. 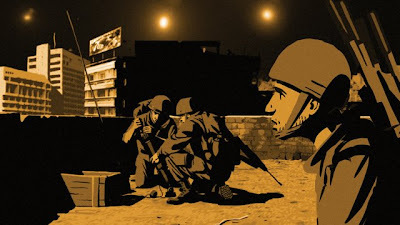 This phenomenon startles Folman when a friend and fellow army veteran fills him in on a recurring nightmare which triggers Folman's realization that he's missing some rather large chunks of his own memory of time spent while serving as an Israeli soldier in the earliest Lebanon War of the 1980s. Ascertaining that the nightmare plaguing his friend is most likely related to the same war, Folman makes a bold decision to fight against our internal human mechanism that prevents us from anything too uncertain to travel the planet in search of old friends, fellow soldiers, and others who may be able to illuminate what's really been left in the darkest recesses of his repressed memories. 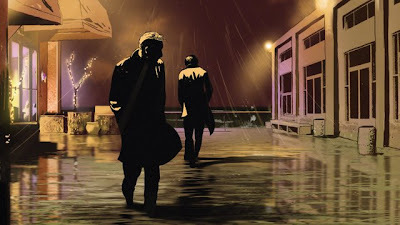 And once the men begin talking, the memories start to finally float to the surface as though they existed just out of reach in the same ocean that's appeared in both the recurring nightmares and in a repeated vision of seemingly allegorical significance in the movie. Using the authentic testimonies of all involved in a film that Folman first shot on ninety minute videotape and then worked alongside artists to animate separately via Flash, 3D, and by hand as opposed to rotoscoping in a process that took four years to produce, we're presented with a surrealist, highly original documentary feature that reminds us that no two recollections are alike. 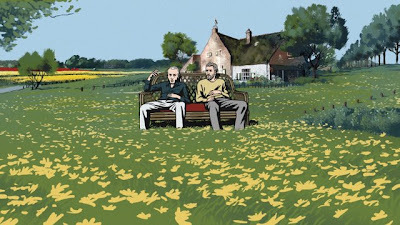 Ambitious in its artistry and easily the most effective animated foreign work in recent memory (surpassing even the critically lauded Persepolis), Folman's Oscar nominated work is both tremendously unsettling and breathtakingly beautiful. Additionally it features a gorgeous score accompanied by both rock music and classic waltzes that hearken to the title which comes from one extremely memorable testimony. 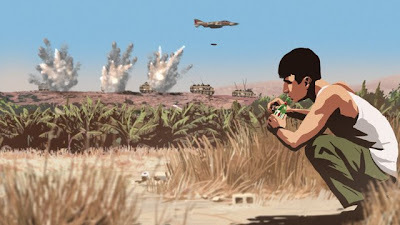 And admittedly while the idea of animating recorded recollections may sound far-out on paper, the diverse styles incorporated in the painstaking 2,300 illustrations turned into animation make Bashir an extremely urgent, unique, and highly original artistic vision. 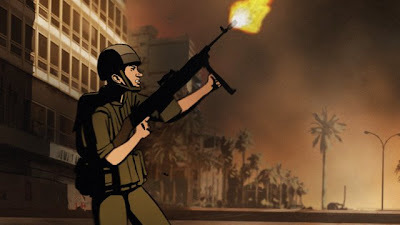 More than just employing animation as a sort of cinematic stunt, Folman's decision to animate the documentary strengthens the work considerably. 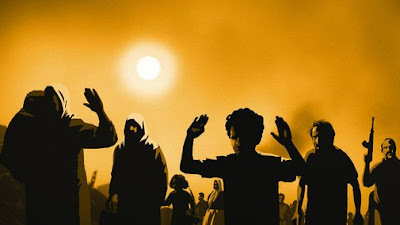 And it does so not just as a fearless retelling of the war and the shocking Sabra and Shatila Massacre that found an estimated 3,000 people murdered but it also helps augment the study of the human mind and how we try and adapt to such hellish events. 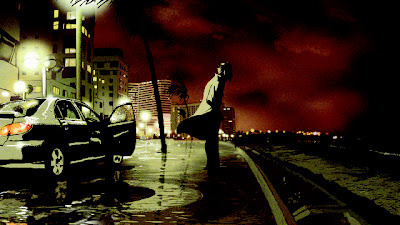 In doing so, the viewer is no longer passive or lulled into a false sense of security since there are no concrete heroes or villains or structural acts as evidenced in most Hollywood war films and we begin realizing that it's hard to anticipate just where this mystery of the past will take veterans in the future. Likewise, it's also completely necessary from an artistic point of view to craft footage by filling out their memories with visuals to match since needless to say they weren't equipped with the technology of today's soldiers that post items on YouTube for the world to see. 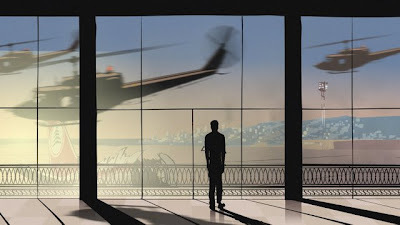 Obviously it's intended as more than just one man's own personal journey to uncover what really happened during that tumultuous and deadly summer. And moreover, it's an important artifact to share with the next generation (including Folman's sons) who, like this reviewer, may be unfamiliar with the events that transpired. 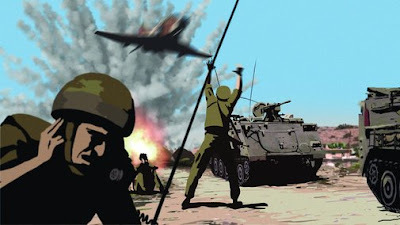 Additionally, Bashir feels incredibly timely as an antiwar film given not just our two ongoing wars but the endless threat of additional conflicts, nuclear devastation, and more battles with each passing year. 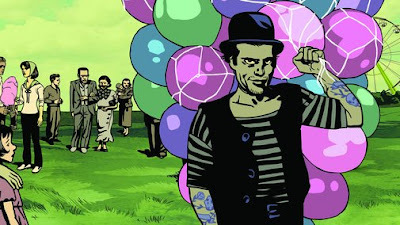 Expertly taking his own background as an award-winning writer, director and filmmaker where he'd begun toying with animation in a documentary television series about "the science of love," Folman moves from love to war for this particular work. 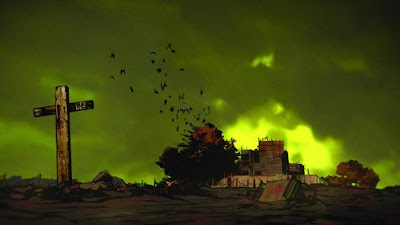 In doing so, he shares that he's against his sons taking "part in any war, whatsoever," by painting the immediacy of it through daring imagery and cinematic techniques. 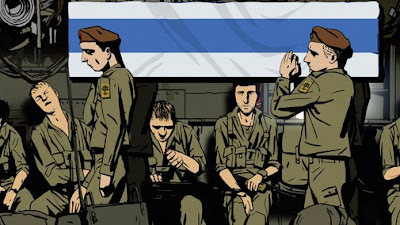 Revealing that the film was made from his own point of view of a soldier in the Israeli army and determining that engagement in war is useless-- seeing the images he pieces together in a visceral tapestry is the best example of his thesis that essentially war consists of "very young men going nowhere, shooting at no one they know, getting shot at by no one they know, then going home and trying to forget." 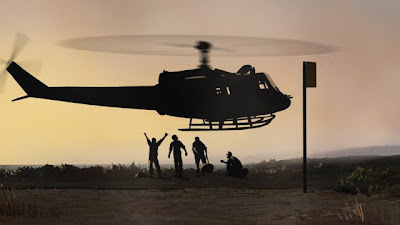 Sharing that "sometimes they can" indeed forget, he's quick to remind that "most of the time they cannot," and the powerful interpretation by Folman hits us much harder than the standard dry, military documentary he wanted to avoid making in the first place. For, due to the lack of footage, it would've consisted of "a middleaged man being interviewed against a black background, telling stories that happened 25 years ago, without any archival footage to support them." 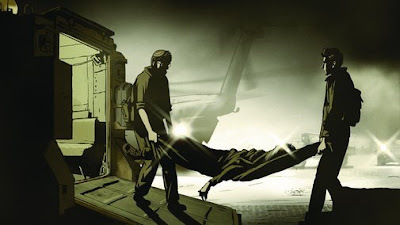 Clocking in at a breakneck ninety minutes, Waltz With Bashir is reminiscent cinematically of Tim O'Brien's literary Vietnam masterpiece The Things They Carried which meandered from one narrative to the next. 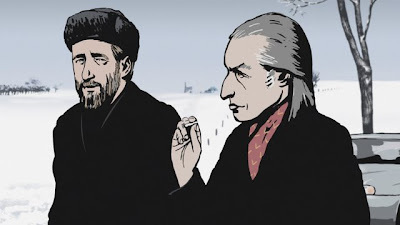 Loading the DVD with extras including behind-the-scenes footage, filmmaker commentary, and a Q&A session-- what is easily one of the strongest foreign works of last year may have shockingly failed to deliver Oscar gold but it will stand the test of time nonetheless. The recipient of the National Society of Film Critics' honor as the Best Picture of the Year, Folman's Golden Globe winning imaginative artistic opus invites us to swim through the perilous ocean of human memory until inevitably our boat sinks or the camera breaks and we're left piecing everything together. 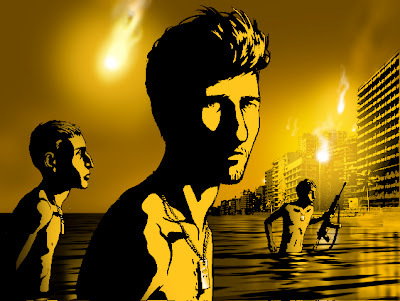 Moreover, by exploring the self-preservation technique we have of blending together fantasy to get by during horrific reality, in the end Waltz With Bashir is an achievement that manages to transcend language itself. 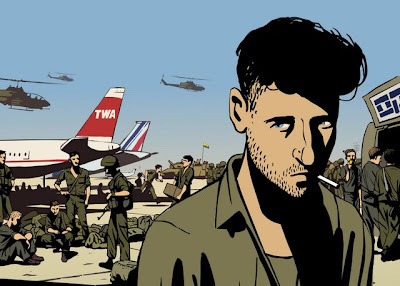 And this is made all the more remarkable due to its striking presentation and unwillingness to compromise its vision as a humanistic thesis on the uselessness of war and the resilience of those who must endure it.